4 Things To Avoid When You’re Training Chest Muscles ! Home Bodybilding Tips 4 Things To Avoid When You’re Training Chest Muscles ! When it comes to training chest muscles, usually on Monday (the universal chest day!) we all like to think we are pretty good at it. Whilst it’s arguably the most popular muscle to train due to the nature of the exercises and the excellent pump you get, many lifters are not getting the most out of their chest day. This article will detail some of the most common mistakes made on chest day and how you can stop yourself from making them. Another very common mistake which is made on chest day is solely doing pressing movements. This could be a barbell bench press, incline barbell bench press, dumbbell press etc. The point is all of these movements are pretty much identical and aren’t really ‘testing’ or giving your chest a proper all-round workout. Bench press is certainly an excellent exercise and there are many brilliant versions of it; however, they shouldn’t make up the entirety of your chest workout. If you’re lifting purely for strength, e.g. powerlifting, then you’re probably going to just be performing bench press – so it’s okay to not include isolation exercises. However, if you’re looking to build muscle mass then you should look at some other exercises. ✓ For example, by isolating your chest with exercises such as dumbbell flys or cable crossover, then you will be hitting your chest from different angles, activating more muscle fibres and thus allowing yourself to build more muscle. In order to build a full, aesthetic chest muscle, you need to work your entire chest. To do this, you need to concentrate on the upper and lower portions of your chest. Simply put, you can put more emphasis on your upper chest by including incline movements into your chest routine. 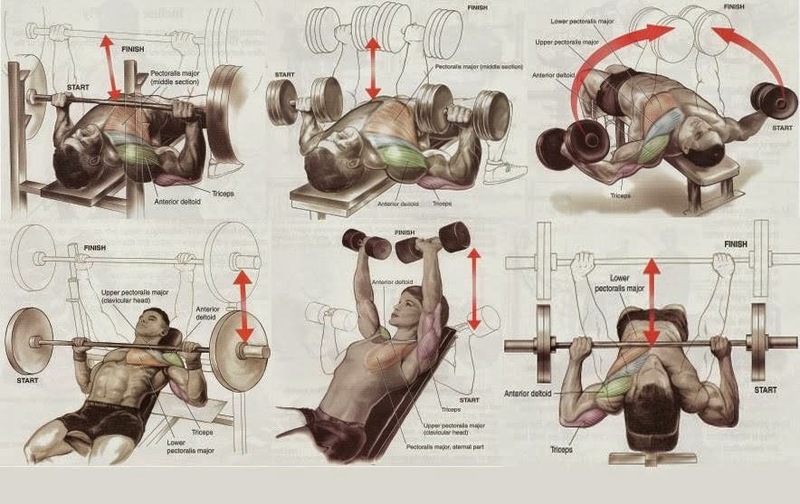 Likewise, to put more emphasis on your lower chest it would be beneficial to perform some decline work. It’s important to note that you cannot isolate your upper and lower chest like you can isolate whole muscles. The visible chest muscle is just one muscle, although you can develop different portions of it by doing different exercises. ✓ Remember, just by including a few incline exercises for a few workouts, it won’t magically give you an amazing upper chest. It’s important to keep at it for a long period of time and keep your body fat relatively low to see the progress you have made. ✓ Furthermore, if you are performing incline exercises (for example,) and you’re performing them later on in your workout, then you are never going to be able to hit them with as much intensity. Instead, you should switch up your routine by sometimes hitting incline first when you have the most energy. This way you prevent your upper chest lagging behind! This is another common mistake which I see being made on a daily basis. For one reason or another, many lifters seem stuck to the machines in the gym. Don’t get me wrong, they have their uses, but they shouldn’t make up the majority of your workout. In fact, it should be quite the opposite. Previous article4 Things You Should Never Do On Back Day ! Next articleHow to Change Leg Press Foot Variations for Total Leg Training ?